To those new in this blog, This is my personal finance journal where I track my monthly spending. 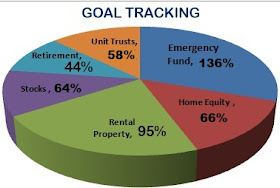 My goal for 2013 is to spend 60% and invest 40% of our income to help me (and hubby) to retire comfortably in our early 40s. How hectic the renovations of one rental unit kept us. I couldn't escape to sneak more posts. The costs of the renovations reflect in our April expenditure and will hit hard on our May one again. We lived on an impressive 40% of our income in March. We stuck below our target budget of 60% spending and 40% investing. This month took us above 100% spending. I wish it was a joke. 17% Target is 25% . Personal Income 56% 82% We are working on growing other income streams to bring this lower and thus diversify risk. Interest/ Dividends 6% 1% Our emergency fund interest and dividends were good. Online Income 0% 0% Next month. Interest on my Emergency Fund is 4.65%, which is below the inflation rate. I took some money to the stocks in January. If the Governor and the Reserve Bank cut rates, I will be very sad. Real Estate 32% 10% Renovations. Transportation 0% 0% Paid mostly with cash left over from last month. Credit Card, Cash & Fees 1% 7% We used the Mr's credit card and paid it off over 50 days spread. Giving 3% 3% This should be at around 10-12%. It will even out during the scholarship payment months. Invested 51% 61% We didn't pay more into our homeloan like we usually do. This is only automated unit trusts and a small amount on the stocks. I no longer top my Just Invest (Nedbank) savings up. We lived on just below 134% of our income in April (comparing to 40% in March). Our Net Worth grew by a tiny margin. For which I am grateful. MAIN GOAL: net worth growth by at least 25%.-- 12% so far. BUDGETING: invest at least 40% of income.-- 73% so far. EMERGENCY FUND: 3 months worth of living expenses.-- DONE. GIVING: give of more than 10% of income.--5% so far. REAL ESTATE: Construct at least 4 flats/ increase the rental income by 30% .-- not yet. MORTGAGE: Pay up our home .-- not yet. STOCKS AND DIVIDENDS: Get at least R12,000 in dividends.-- not yet. EXTRA INCOME: Online income to R8000 per month by December 2013.-- +/-R3700 April.